Series I modulators use a rectangular shaped modulator optical element. This optical assembly is designed and built to vibrate at a resonant frequency that is determined by its size. Different optical materials are used to cover the operating range from vacuum UV to near IR. Series II modulators use a symmetric or octagonal shape for the modulator optical element. A two-dimensional standing wave in the optical element doubles the retardation available for a given drive voltage. Series II modulators are particularly useful in the infrared spectrum. Hinds application scientists are available to consult on the optimal material and model for your particular experimental setup. 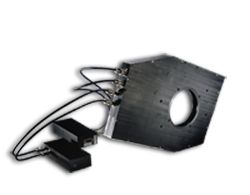 Dual PEM systems provide the capability to make real time polarization analysis measurements. When only one PEM is used, two measurements must be made with the sample rotated 45° after the first measurement. However, measurements can be made in real time using two PEMs mounted at 45° with respect to each other. Hinds Instruments makes modulators for use across many wavelength ranges. Please click on your wavelength range below for more information.